This special issue comprises of thirteen selected papers from the International Symposium on Information Processing 2009(ISIP 2009), Huangshan, China, 21-23 August 2009 and International Symposium on Intelligent Information Systems and Applications 2009 (IISA 2009) , Qingdao, China, 28-30 October 2009. The conference received 623 papers submissions from 11 countries and regions, of which 320 papers were selected for presentation after a rigorous review process. 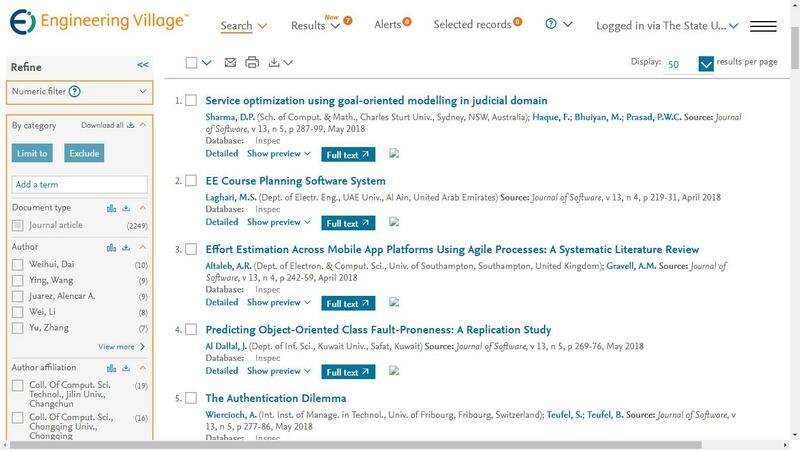 From these 320 research papers, through two rounds of reviewing, the guest editors selected thirteen as the best papers on the Software track of the Conference. The candidates of the Special Issue are all the authors, whose papers have been accepted and presented at the ISIP 2009 and IISA 2009, with the contents not been published elsewhere before. The ISIP 2009 are Co-sponsored by Jiaxing University, China, Peoples' Friendship University of Russia, Russia, Nanchang HangKong University, China, Sichuan University, China, Hunan Agricultural University, China, National Chung Hsing University, Taiwan, Guangdong University of Business Studies, China, Academy Publisher of Finland, Finland. The IISA 2009 are Co-sponsored by Qingdao University of Science & Technology, China; Peoples’ Friendship University of Russia, Russia; Nanchang HangKong University, China; National Chung Hsing University, Taiwan; Hunan Agricultural University , China; Guangdong University of Business Studies, China; Jiaxing University, China. Technical Co-Sponsors of the conference are IEEE, IEEE Shandong Section, IEEE Shanghai Section. “A Novel Medical Image Dynamic Fuzzy Classification Model Based on Ridgelet Transform”, by Zhiming Cui and Guangming. Zhang, proposes a novel classification model for medical image, which is using ridgelet transform and dynamic fuzzy theory.